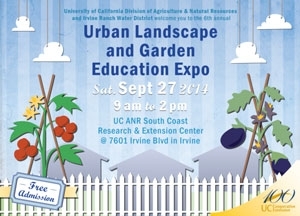 Whether you're trying to deal with the drought, intrigued by composting, or wondering what's “bugging” your garden, you'll find answers to your questions at the Urban Landscape and Garden Education Expo at South Coast REC on Saturday, Sept. 27th. It's a great time to bring family and friends out to the site, which is usually closed to the public. The free event runs from 9am until 2pm at 7601 Irvine Blvd. in Irvine. Docents will be on hand to explain the water saving features of the landscapes and to answer questions about plants. All plants are labeled, so if you see something you like, you'll know what to buy. There will also be tram tours of the fruit orchards, urban chickens, raised bed vegetable gardens, vendors, and a plant sale. If you get hungry, the Flip Truck will be selling sliders. 10:05 a.m. Portable Self-watering Vegetable Garden Containers – Learn how to create a portablevegetable garden. 11:05 a.m. Create a Hypertufa Pot – Learn how to make a hypertufa pot. 12:05 p.m. Compost 101 – Learn how to turn yard waste into black gold. Therry Vargas will be there to answer questions about urban chickens, and Isabel Barkman will be on hand with a taste of what's growing in the orchards. Vendors, local water agencies, and UC experts will provide information to help you have a healthier water-wise landscape. The school garden area has been update and includes raised beds made from a variety of building materials. You're sure to find something you can reproduce at home. An assortment of different compost bins is actively making good stuff for the garden, and Master Composters will help you get started with your own. If you're looking for plants that can live with little water, wander over to the front landscape area. All plants are labeled, so if you find something you like, you can find it at the nursery. In fact, you may not have to drive to the nursery, because plants which have been carefully tended in the hoop house will be on sale right there. Hop on a tram to see the orchards, listen to a speaker to find out about efficient irrigation, check out the self-watering tomato bins, and marvel at the demonstration landscapes. All for free! Who needs Disneyland?